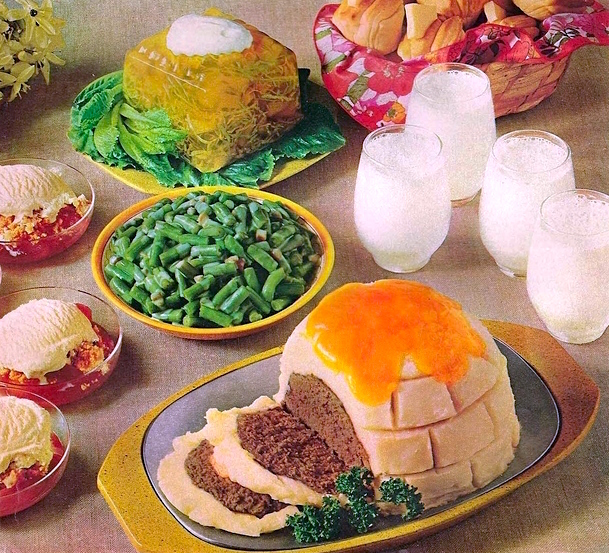 Igloo Meat Loaf Recipe: VINTAGE DINNER MAGIC! Published in the the January 1967 Family Circle Magazine, this photo of a well-balanced dinner features one of the most glorious recipe ideas we have ever seen, Igloo Meat Loaf! Served alongside green bean casserole, gelatin salad, rolls 'n' butter, cold milk and a dessert of cinnamon apple crisp with vanilla ice-cream, this imaginative and fun entree is a surefire kid pleaser (and we reckon adults will love it too)! Next time you want to wow the entire family, try making this gem yourself! In a bowl lightly mix ground beef, crumbs, onion, salt, pepper and evaporated milk just until blended. Pack firmly into a 1-1/2-quart bowl; turn out of bowl onto a shallow baking pan. Bake in a preheated 325 degree oven 1 hour 15 minutes to 1 hour 30 minutes. In a 1 -1/2-quart saucepan combine water, evaporated milk, salt and butter; bring just to boiling. Remove from heat; with whip or fork stir in potatoes; whip briskly. Frost loaf with potato mixture. Bake an additional 15 minutes. Place Cheddar cheese slices on top of Igloo; return to oven just until cheese starts to melt. Serves 6 to 8.